In this article, you will learn about the “Auctions” section of product details page. Seller – Here the seller’s account name will appear which will be used to list on eBay. Seller’s accounts are configured in step 11 of the Control Panel. Online Auction – This will be an auction item on which customers will bid. Only auction items can be created from this section. Fixed Price listings can be created from the Multilister section. Site – Choose eBay venue like Canada, US etc. Duration – Specify how long would the listing be listed for. Listings that have lapsed will automatically moved to the Unsold status, where it can be re-listed in a multitude of different ways. Paypal Account – Choose Paypal account for paypal transactions. Please note that eBay Business Policies will override this setting. Starting Price – Specify the starting auction price. Listing Template – Choose a template for your listing. They are configured in Step 10 of Control Panel. Reserve Price – This price is the minimum you will accept for a listing. Relist Profile – Choose a profile you want to use to relist the product when the listing ends. Note: This field is still under construction and not supported on new interface. Buy It Now price – Specify a fixed price for your listing. An auction listing can have a Buy It Now price as well. Listing features – You can spruce up your listing even more with these options. eBay will charge you for some of these features per listing. Bold title – This will bold the listing title. Featured Plus – eBay will feature your item for a fee. Enable at eBay. Highlight – This adds bright colored band to your item. Homepage featured – eBay will feature the item in their homepage for a fee. Borders – This adds border in your listing to make it stand out. Require Immediate Payment – Only for Buy It Now listings. Enabling this means you need payment immediately after buyer commits to the item. Private Auction – If you have a high priced item or want to keep your buyer’s information anonymous. Disable Sales Tax – depending on the state or province, you can remove sales tax. Donate % of Sale – Check this option if you want to donate a % of your sale to towards a charity. You will need to fill out the Percent and the Organization you are donating to. Counter – will show you how many times this listing has been viewed. Gallery – You should always set to “Gallery”. This will show your gallery in the listing. Picture pack – the picture pack gives a ‘zoom’ capability for images in the gallery. Images must be uploaded over 800px. This is also free for eBay US and Canada. International Site Visibility – This allows your listing to be seen in other eBay sites. Please note that eBay will charge a fee for this feature. List Product Using eBay’s UPC / ISBN – This option is available when the item was added by UPC. TITLE: This title will override the title you provided in general section. SUBTITLE: This subtitle will override the subtitle you provided in general section. Note: It is highly recommended to fill eBay Category and item specifics as they will give better visibility to the listing and buyers like it as it gives them more info. Note: You can create business policies in the Control Panel to be used in this listing (if needed) . You can use this option only if you’ve been accepted to use business policies. Return policies are where you specify whether or not you accept returns. If you accept returns, include any return conditions and the amount of time a buyer has to return an item. This will override the Return Policy below. Shipping policies are where you specify your handling time, the shipping services you offer, and shipping costs. This will override any shipping settings you specify in the product. Use the check-box ‘Returns Accepted’ to show more fields. Refund Type – The default option is “Money back”. You can use “Money Back Or Exchange” option if you are listing to eBay US or eBay Motors. Refund Within – how long does the customer have to initiate a refund. Shipping Cost Paid By – you can let your customer pay for the shipping of the item back or you eat the cost. Below you’ll specify the available shipping options for this listing. These details will be used for eBay. Using business policies will override these settings for eBay. This is only useful if the seller is not using business policies. Handling Time – The number of business days you will take the ship the item after receiving the cleared payment. 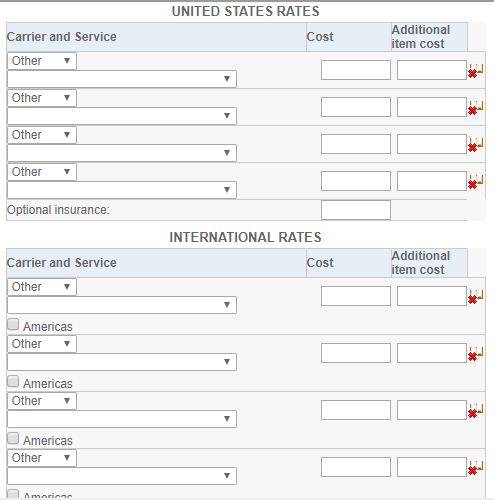 Override shipping exclusions profile – This option does not work with GSP. It will override the settings specified in the Control Panel Step 5. Block bidders who are registered in countries I do not ship to. Use Exclude Country Feature – You can exclude certain countries from purchasing or bidding in your product. Select the countries from the drop-down which you want to exclude.